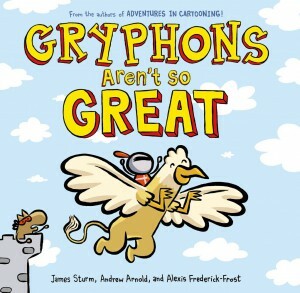 I received a publisher’s review copy of Gryphons Aren’t So Great and my mother-in-law remarked at the spelling in the title so I looked into it. Griffin and grphyon seem to be variants meant to describe the same mythical creature with the body of a lion (except for the front feet which feature talons) and the head and wings of an eagle. (Source: https://en.wikipedia.org/wiki/Griffin) For Harry Potter fans, a Hippogriff is the child of a griffin and a mare (who knew?). Anyway, back to this cute little book. My son loved the idea of a knight and horse being best friends — even jumping into water together and having adventures — but he was sad when the knight abandoned her stalwart friend for a flying one, the titular Gryphon. The knight is ignored when the Gryphon meets one of his own kind and realizes she should have stayed loyal to the horse, Edward. I like that the horse has a name but the knight doesn’t, kind of a turnabout. It is a quick, graphic novel style read and after one go through my son was ready to re-tell the story from the pictures. A good book for beginning readers but probably too short for older kids. Pre-K to 2nd grade is probably ideal. We love this book! It’s such a wonderful lesson about friendship, and the illustration style is accessible and fun. In our family, we had a reflective conversation about how we can relate to each of the three characters at different times. This is a great little book to have on hand in case of friendship changes or drama as well.